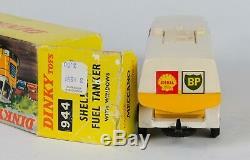 Dinky 944 Leyland'Shell-BP' Fuel Tanker. Rare White Chassis with White hubs (one Grey). Made by Dinky in the late 1960's, the Leyland Octopus Tanker has a Gloss White and Yellow cab with no glazing, with the scarce gloss White chassis to the tanker. Yellow and Cream-White plastic Tanker section with'Shell' and'BP' logo lables to both sides and to the rear. Black rubber tyres over white plastic hubs, apart from just one hub (rear right), which is light Grey, making this an unusual transitional example, as Dinky moved from using grey hubs to white. The model is in near-MINT original condition, with just a few very tiny surface paint rubs. The side BP-SHELL labels both have slight nibbles. The rear label is perfect. Please take time to examine our photographs, to satisfy yourself as to the condition of the model and the box. It comes in the all-card illustrated box, which is in Excellent original condition, complete with all end-flaps and tabs. Some wear in places, mainly to open end-flap pictured, which has some light surface scuffing and a USA toy store price label. Our high-resolution photos form part of our item description, so please examine them closely. A nice example of this RARE issue, which will display well. 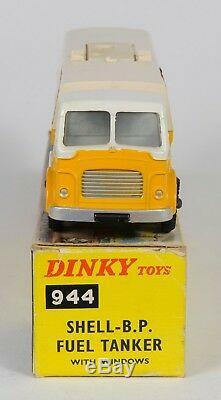 Please check out our other Dinky & Corgi Models in our shop. 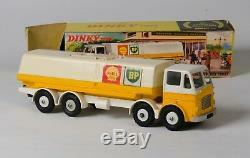 The item "Dinky 944 Leyland'Shell-BP' Fuel Tanker. MINT/Boxed" is in sale since Sunday, January 28, 2018. This item is in the category "Toys & Games\Diecast & Vehicles\Cars, Trucks & Vans\Vintage Manufacture". The seller is "abbeytoys2003" and is located in Poole, Dorset. This item can be shipped worldwide.